Denim goes with everything, right? 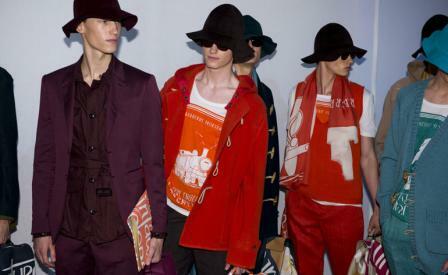 At Christopher Bailey's S/S 2015 men's show for Burberry it very well nearly did, with jean jackets tipped as a styling staple to underscore his vivid, sporty show - formulated in a sweeping colour gradient of coated, suited silhouettes cut in nubuck, velvet, linen and cashmere. Departing from inky purples, teal, burgundy and loden green, Bailey built up a jewelled rainbow of outerwear archetypes into eye-watering combinations of sunny yellow, vermillion and turquoise, an effect doubled (yet softened) in ombré cardigans or the half-tone highlight of beaten felt sunhats. Inspired by the storytelling of 20th century British writer Charles Bruce Chatwin, a passage of briefcases, shawls and a hand-painted jacket adorned in crisp calligraphy matched the carpet of the Kensington Gardens show tent, emblazoned with romantic snippets of prose.